On track: India Infrastructure, the APL firm that runs container trains, has the licence to run freight trains across India for 20 years. Mumbai: After launching its container train services on 31 May, APL, the container transportation arm of Singapore-based transportation and logistics firm Neptune Orient Lines (NOL), will, from Thursday, start operating trains carrying only refrigerated containers loaded with perishable goods. This service was until recently the monopoly of the state-owned Container Corp. of India Ltd (Concor). 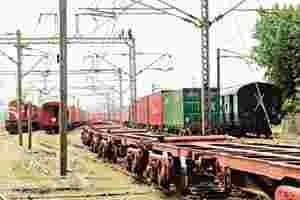 India Infrastructure and Logistics Pvt Ltd , the APL company that runs container trains service, will flag off its first full refrigerated container train service from Loni in Uttar Pradesh to Jawaharlal Nehru (JN) Port in Mumbai. It will haul 43 containers loaded with buffalo meat from India’s biggest buffalo meat exporter Allana Sons Ltd to the port, India’s largest container shipping one, from where it will be shipped on specialized container ships owned by APL to three destinations in West Asia, according to an APL executive, who did not want to be named because he is not authorized to speak to the media. India Infrastructure holds a Category 1 licence that allows it to run freight trains across India for 20 years; this period can be extended by another 10 years. India Infrastructure is a joint venture between APL India and Hindustan Infrastructure Projects & Engineering Pvt Ltd, a firm controlled by Rajeev Chandrasekhar, the former promoter of mobile firm BPL Communications. APL India has a 76% stake in the joint venture while Hindustan Infrastructure holds the remaining 24%. NOL, 68% owned by the Singapore government-owned investment company Temasek Holdings (Pvt.) Ltd, is the largest shipping and transportation company listed on the Singapore Stock Exchange. Since launching container train services branded APL lndiaLinx in May, APL has been carrying about 20-22 refrigerated containers on every run from Loni to JN Port for the past three to four weeks. “For the first time, we will be running an all refrigerated container train service on Thursday carrying 43 forty-foot equivalent unit (FEU) containers which is the maximum capacity of a container train service," the APL executive said. An FEU is double the size of a twenty-foot equivalent unit (TEU) which is the standard size of a container and is a common measure of capacity in the container business. Refrigerated containers, or reefer containers, are used for transporting perishable goods. India’s reefer container market is estimated at 70,000 FEUs a year and is growing at 10 -12% a year, according to the Container Shipping Lines Association, an industry body representing container shipping lines that operate from and to India. A FEU can typically load about 25 tonnes of perishable cargo, usually frozen meat, frozen seafood, fruit, vegetables and dairy products. It costs two times more to ship refrigerated containers than normal containers. The ocean freight rate for moving a normal forty-foot container from JN Port to Jebel Ali in Dubai is about $800. In comparison, it costs about $1,700 to ship a forty-foot refrigerated container from JN Port to Dubai. Fifteen operators, including Concor, have since won rights to run container trains to various ports after the government privatized rail freight services in 2005. Out of the 15 licensed operators of container trains, eight have started operations, but apart from Concor, India Infrastructure is the only other firm that runs trains carrying refrigerated containers.